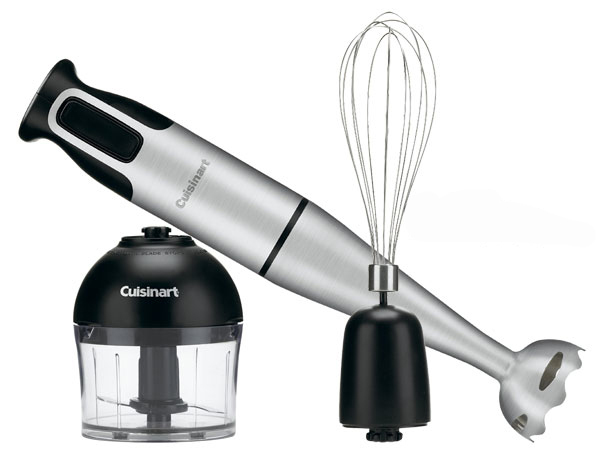 Cuisinart makes it quick, clean, and easy to blend, prep and whip a variety of ingredients. Our SmartStick Hand Blender includes Whisk and Chopper attachments to extend this blenders performance. Blends or whips right in the bowl, pitcher or pot, to eliminate extra dishes, and with the Chopper attached, it turns into a handy mini food prep tool. The look is commercial, the performance is professional, and the ease of use is pure Cuisinart! Limited 3-year warranty. Watch a demonstration of the Cuisinart Immersion/Hand Blender, showing you how to make delicious carrot soup with ease.